Well, I know it’s early in 2018, but I’ve already gotten my favorite email of the year. It’s a press release that boldly answers the question we’ve all been asking: What’s with the Birnbom situation? 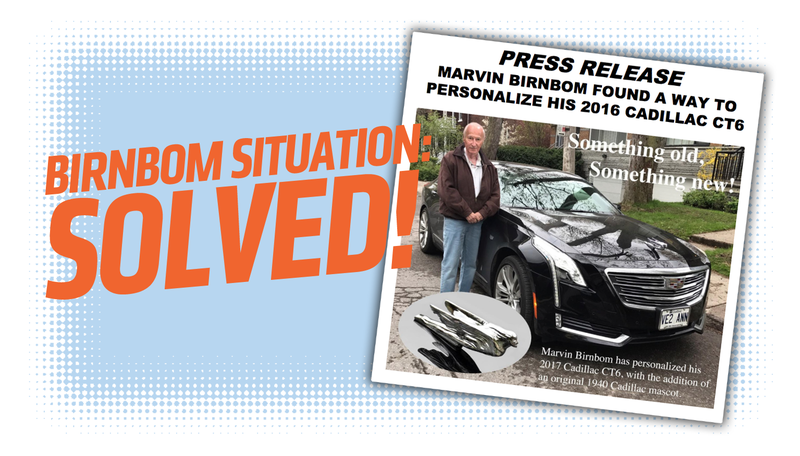 Has Marvin Birnbom found a way to personalize his 2016 Cadillac CT6? The answer, I’m delighted to say, is yes. Yes he has. I’m a little confused about this copy, because it starts by referring to Marv in the third person, then switches to first person, which still seems to be Marv? Still, that barely matters, because the point is that Marv Birnborn has acquired a 1940 Cadillac hood ornament, carefully affixed it to his car hood, and is now thrilled. And I can see why! That’s a fantastic hood ornament, and it looks great on his CT6, despite the decades of time separating the two elements. Marv is a man who is clearly enjoying his Cadillac CT6 to the absolute fullest, and that makes me very happy. I love that this guy was so delighted with his bit of car personalization that he decided to release a goddamn press release. I mean, really, who hasn’t wanted to do something like this when you’ve made a cool modification to your car? Hell, we write articles when we do things to our cars here—why shouldn’t Marv Birnborn have that right, too? Marv did the work himself, nervously drilling into the Cadillac’s $2,000 aluminum hood. Marv is delightful. I hope I’m as enthusiastic and adventurous as Marv is when I’m pushing 90. And I think I’ll follow his lead and issue a press release for every freaking thing I do to my cars. So, let’s hear it for Marv, and all agree to request document 610.